An American woman has just released a harrowing book about her experiences as head of a Planned Parenthood clinic. "I know there are many people here tonight sitting in on this webcast from Planned Parenthood, and I want you to know, I was one of you, I sat in on these calls, too." 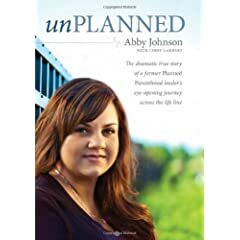 Abby Johnson was speaking to over 21,000 people across the nation and beyond, on a webcast widely promoted and globally available. It was the eve of the launch of her book UnPlanned and anticipation was intense. It’s the fascinating story of her journey from gullible college student raised in a pro-life Christian home to her recruitment into the abortion industry to the day her work there changed her life forever. The book was never intended to be an expose of Planned Parenthood. But her tale runs straight through it. The abortion industry relies on controlling the message. It has from the beginning of legalized abortion in America. Over the decades, it has had few high-profile defections to blow the cover. One of the original founders of NARAL Pro-Choice America, the group largely responsible for the passage of Roe v. Wade, eventually converted and took this confession to YouTube: “We made it all up. One of our strategies to export abortion across the land was to deny what we knew to be true, that abortion kills an existing human being.” They also made up numbers and distorted facts to sway judges, he said. Dr Bernard Nathanson, a powerful witness to the inside story behind the success of abortion activism, witnessed the powerful truth of what abortion is when he saw it on ultrasound. In September 2009, that’s exactly what turned Abby Johnson’s life around, in about ten minutes. On an otherwise normal day at work as the director of a Texas Planned Parenthood abortion clinic, Johnson was startled to be called into one of the rooms to assist in an ultrasound abortion. That denial, both visceral and calculated, is central to the story of abortion in America in general, and Planned Parenthood’s role in particular. Through her eight years with Planned Parenthood, after two abortions of her own, Johnson counseled women about contraception and the ultimate choice of abortion. But she lived in a numbed denial, and never knew the facts about conception, pregnancy and what its termination meant. Until ‘The Ultrasound,’ the account that constitutes the very brief but breathtaking first chapter of her book. She wanted to “help hurting women,” but she recoiled from the procedure room, telling herself “I don’t want to be here. I don’t want to take part in an abortion.” Her instincts were keenly alert to realities she never learned but somehow knew on a deeper level. If so fundamental a message as that is false, what else does the abortion industry falsify in order to profit as a business and attract new clients? It’s extremely rare to get this firsthand account from someone inside Planned Parenthood. Telling it is important to Abby Johnson’s conversion. “If you are pro-life, have a plan of action when somebody like me comes to you and says ‘I want to get out of this industry.’ When somebody like me walks into your office, you’d better be ready to help them. Everyone will, in more ways than one. But it’s a dis-ease we all need to confront. Sheila Liaugminas is an Emmy Award winning journalist. She blogs on American politics at SheilaReports. UnPlanned is available at Ignatius.com. This article is published by Sheila Liaugminas and MercatorNet.com under a Creative Commons licence. You may republish it or translate it free of charge with attribution for non-commercial purposes following these guidelines. If you teach at a university we ask that your department make a donation. Commercial media must contact us for permission and fees. Some articles on this site are published under different terms.